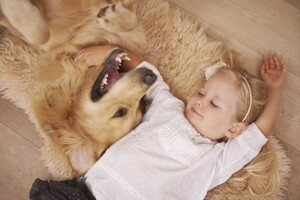 Pet owners understand the deep bond between child and pet. We may remember our own dress-up tea parties that included the reluctant family retriever, or lovingly recall how our cat could magically make us feel better when we were sick or scared. Kids and pets just seem to go together, it’s clear. But, what isn’t as clear is how to teach our children about responsible pet care and when and how to involve them in pet-related chores. Most children form ideas about animals through an assortment of stuffed toys, favorite childhood books, and the many movies that use animals as storytellers or subjects. While entertaining and endearing, these can promote fanciful ideas about animals with very little education. When a child is fortunate enough to grow up in a home with pets, he or she may already have a pretty good understanding of why Mittens doesn’t like to be picked up or when Fido is fed his meals each day. But, still… you may wonder how prepared your child is to take on actual pet care tasks themselves. If you are considering a pet for your child, we recommend taking these important steps in preparation. Once your family has determined that you’re ready for the financial and time commitments required for a new fur friend, you may wish to include your children in learning what the new pet will require and involve them in daily pet care. There are a number of benefits to encouraging your children to be active participants in pet care. This opportunity for early involvement is essential in encouraging responsible pet ownership later in life (and even during those tough teen years). Pet health education – This might include important lessons about why pets need to be spay/neutered, what vaccinations do and why they are important, and why the pet needs to see the veterinarian (and, a good segway for why kids need to see the pediatrician or family physician, too). Respect and kindness – Children will benefit from learning about how pets also have their own preferences and boundaries, and deserve to have those needs respected. Other lessons can include teaching gentle touch and handling, reading body language and signs of fear (ear and tail positioning, displaying teeth, etc. ), and natural behaviors in cats, dogs, and other pets. Daily pet care – Daily pet chores can be introduced slowly and increase with maturity. A good place to start is in modeling pet care activities and allowing your child to assist. Over time chores such as hair brushing, daily feeding, and opportunities for exercise can be added (with supervision until your child adjusts and is capable of handling the care tasks alone). Human and animal safety – Avoiding situations like pet poisoning or an accidental dog bite relies on education and prevention. By teaching your child the appropriate ways to interact with pets, foods that can harm cats and dogs, and what to do if a wild or strange animal is encountered are imperative animal lessons that encourage safety for our children and our pets. Encouraging your child to take on his or her share of family pet chores is more than just ensuring a healthy approach to responsible pet care. In many cases, you are instilling a deep affection for our four-legged friends and a concern for animal welfare. Many children who grow up with a BFF dog or cat remain active in caring for animals through adoption and advocacy, and go on to teach the next generation, their children, to love and care for animals too. If you have any questions about preparing your family for a new pet or age-appropriate chores for your children, please contact us. We accept walk-ins during our Doctor’s Hours to meet your busy lifestyle. If you’d prefer to make an appointment, we offer those too! We offer plans for puppies, kittens, adult dogs & cats. With affordable monthly payments and our convenient hours, it's the best value in helping your pet live a longer & healthier life! Call us at 630.665.1500 for details! We are currently fostering some great pets available for adoption! Visit our Featured Foster page HERE to view all animals available for adoption and make an appointment to meet them at our clinic by calling us at 630.665.1500! “Everytime we brought our pet into the clinic we have received excellent service.”—Anna Rubino. “The complete experience fron wheaton animal hospital has always been superior thank you for always taking wonderful care of rocket.”—Happy Customer. “Best grooming we've had on this dog. Thanks.”—Happy Customer. “We are always treated well, questions answered and directions for care are explicit. Dr. Beisner was wonderful and treated our dog with kindness, care and expertise..”—Happy Customer. Visit Wheaton Animal Hospital at a time that is most convenient to you and your busy lifestyle. Copyright © 2019 Wheaton Animal Hospital. All rights reserved. Veterinary Website Design by Beyond Indigo Pets.